w/ Antibalas & Ska Cubana. FREE! Liebe KlezMORE Festival Vienna-Fans—und alle, die es noch werden wollen! Keine Eintagsfliege, sondern schon bald wieder Institution#8212;das 3rd KlezMORE Festival Vienna 2006 zieht wieder ins Lande, und es zieht immer mehr Interessenten an. Aufgrund dieser positiven Entwicklung vergrössern wir deshalb mit gro�er Freude das KleZMORE Festival. Zwei Wochen lang können Sie aus dem vielseitigen Angebot wählen, ohne etwas zu versüumen. sowie die Pr@auml;sentation der Wanderausstellung der Stadt Gelsenkirchen, "Klezmer#8212;hejmisch und hip". Im Klezmerfestival-Club Tachles k@ouml;nnen Sie spontane Sessions erleben, und Kr@auml;fte f@uuml;r die n@auml;chsten Tage sammeln. 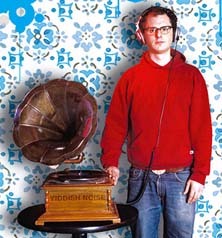 Werte Besucherinnen und Besucher, freuen Sie sich mit uns auf die Er@ouml;ffnungsgala im Porgy & Bess, sowie auf spannende und einmalige Begegnungen beim 3rd KlezMORE Festival Vienna 2006. Come dance by the flatbed! merges Heaven and Earth through music and stories. Ce stage de cinq jours consiste en trois cursus parallèles de musique Klezmer, chanson Yiddish et nigunim, et de danse juive d’Europe orientale, animés par des musiciens de renommée internationale. Il met l’accent sur l’interaction entre la pratique musicale d’une part, et l’histoire et la spiritualité juives d’autre part, et propose aux participants de se confronter avec le jeu sur scène. Le stage est ouvert à tout public à partir de l’âge de 9 ans, professionnels ou non. This five-day course offers three concurrent programs, in Klezmer music, Yiddish songs and traditional melodies, and Eastern European Jewish dance, all led by internationally famous musicians. With an emphasis on the interaction between musical practice and Jewish history and spirituality, participants are encouraged to experience the realities of performing with an audience. This course is open to the general public from the age of 9 on, professional musicians or amateurs. Looking for a great klezmer band for a celebration? World-renowned klezmer fiddler Alicia Svigals' party band is playing a free lunchtime concert 12:30 on Thursday in the East Village; a wonderful opportunity to experience the band live. It will be an all-klezmer show, but bar/bat mitzvah and wedding information packages, with recordings of our musicians playing rock/jazz/R&B etc, will be available upon request! Thursday, July 6, 12:30 p.m., at Abe Lebewohl Park (formerly St. Mark's Park)Second Avenue and 10th Street, in front of historic St. Mark's Church-in-the-Bowery. Free admission—rain or shine! For further info, click on "Music in Abe Lebewohl Park" at the top right. Part of the Third Street Music School Settlement's concert series. Thursday July 6, Alicia Svigal's Klezmer Fiddle Party Band Free 12:30 p.m. lunch concert at Abe Lebewohl Park (formerly St. Mark's Park) in the East Village; part of the Third Street Music School Settlement's concert series. Second Avenue and 10th Street, in front of historic St. Mark's Church-in-the-Bowery. In case of rain, performances are held on the portico of the church. Thursday - 7/6: At Abington Art Center 515 Meetinghouse Rd, Jenkintown PA, 7:00 PM, for more info go to website or call 215-887-4882- free! Discussion on the devotional music from the Sufi practice of moving-prayer meditation (Whirling) and the use of sound in sacred trance settings from Turkey to Morocco. Also, comparisons and contrasts between Hassidic-Jewish music and trance dance will be discussed, followed by a demonstration of various sacred musical traditions and their meditative power. Participants will be invited to use their voice in experiencing some of the sacred chants. Parking: Convenient underground parking only $1.50 for two hours with validation. Enter lot from Navy Street. Our last scheduled NYC show of the summer... full octet, with special guest. Directions to this new-ish park are below -- plus a tip for Ismail Butera fans! Riverside Park South is located on the Hudson River waterfront between 62nd & 72nd streets. Acoustic Sunday shows take place on Pier I @ 70th Street. The entrance to the park is located at 68th St. and Riverside Blvd. (**note that this is not Riverside Drive). Enter Riverside Blvd from 66th or 70th streets. You can also enter the park at 72nd street and walk south to Pier I. 1 Train to 66th St. Walk west on 66th St. to Riverside Blvd (the end). The Riverside Park South entrance is at 68th St. You will be able to see the park from this entrance. 2 & 3 Trains to 72nd St. Walk west on 72nd St. and make a left onto West End Ave. Turn right at 70th street and walk west to Riverside Blvd. The Riverside Park South entrance is at 68th St. You will be able to see the park from this entrance. Use the West End Ave and Broadway lines and follow the above the directions. Cross-town buses: M72 headed west. The bus will stop at Freedom Place & 68th St. This stop is a block away from the park. Parking is available is in the Quick-Park lot on 68th Street between Riverside Blvd and Freedom Place. To enter the lot, drive west on 70th or 66th Streets to Riverside Blvd. Enter the lot on 68th Street. Traverse the deserts of the Middle East, the mountains of northern India, and the warm waters of the Mediterranean with Eliyahu Sills and his Qadim Ensemble. Qadim is a word found both in Hebrew and Arabic meaning "ancient past" and "that which precedes" as well as "forward movement" and "that which will come." The band is aptly named as their ancient and timeless music bridges cultures from throughout the near east, such as Mizrakhi, Sephardic and Ashkenazi, with Arabic, Turkish, Persian and north Indian. 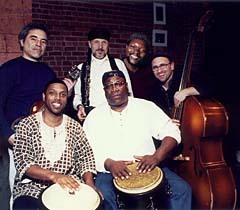 The group and their music bring ancient musical traditions to a contemporary audience, allowing for a musical dialogue between the different cultures. The group performs instrumental pieces as well as songs with words in Hebrew, Arabic, Greek, Turkish, Farsi and Ladino. Eliyahu Sills is the founder of Qadim and plays the Nay (reed flute of the Middle East), Bansuri (bamboo flute of India), and vocals. He is joined by Rachel Valfer on vocals and Oud (Middle Eastern lute), and Jason Ranjit Parmer on Indian Tablas and frame drums from Turkey, Pakistan and Persia. just off the 101 (Hollywood) freeway across from the Hollywood Bowl and south of Universal Studios. Experience Israel's dynamic musical culture: classical and pop selections influenced by folk sounds of Eastern Europe, the Mediterranean and the Middle East. The "totally charismatic" (Jerusalem Post) Chen Zimbalista guest stars on marimba. Alon Reuven solos on french horn. 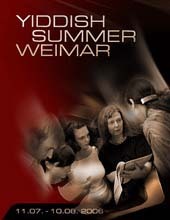 Yiddish Summer Weimar 2006: Basarabye! 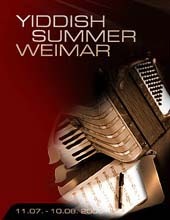 The Weimar Klezmer Weeks, runs this year from July 11 through August 10 in Weimar, Germany. Possibly the most romanticized of all the "old worlds" of Yiddish, Bessarabia (part of present-day Moldova) is still mythic in Jewish memory and imagination today. Much of the modern klezmer "sound" as well as many Yiddish dances and songs point back to Bessarabian origins. Devastated by war and politics, the remnants of Bessarabian Yiddish culture survived the 20th century scattered throughout the world. 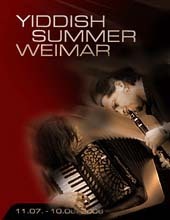 In 2006, Weimar Yiddish Summer (formerly Weimar Klezmer Weeks) will gather together artists and musicians from the USA, Moldova, the Ukraine and elsewhere to conduct a unique, month-long, intensive workshop/festival focusing on Bessarabian Yiddish expressive culture. 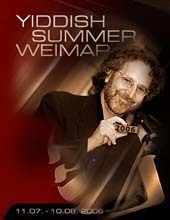 As in past years, Weimar Yiddish Summer explores one subject at a time in workshops lasting from 3–7 days. In 2006 our subjects are: Yiddish Language (beginning and intermediate), Learning By Ear, Introduction to Klezmer Music, Yiddish Song, Dance Music for Musicians, Yiddish Dance, and Advanced Klezmer Music (see schedule). Program director Alan Bern has given Weimar Yiddish Summer 2006 an even stronger emphasis on interculturality: in addition to the regular group of eminent faculty, guests in 2006 include clarinetist German Goldenshteyn (Bessarabia/USA), singer Arkady Gendler (Ukraine), singer/songwriter Efim Chorny (Moldova), dance teacher Nicolae Grinbincea (Moldova), and many others. Michael Alpert and Zev Feldman will lead us through Bessarabian Yiddish history and ethnography as well as Yiddish dance. As always, daytime classes are complemented by evening programs including public jam sessions in Weimar's cafes, concerts, dances, films, lectures, and more. Participants come from all over Europe, North America, and even Asia, and often form personal and professional relationships that extend far beyond Weimar. Whether for a single workshop or for the entire period, we invite you to join us in 2006 for what promises to be the most exciting and challenging Weimar Yiddish Summer yet! unique pieces, recorded almost exclusively on multi-tracked viola. an especially choice claim on uncharted territory with his solo debut. from little more than the gorgeously grainy purr of his fiddle." Join fellow music lovers and Yiddish enthusiasts on Thursday July 13 @ 7:00 PM for Yiddishfest 2006: With Heart and Soul (Mit harts un neshame), a joyous free concert of music in mamaloshn at Damrosch Park in Lincoln Center at 62nd St. near Amsterdam Avenue. The Workmen’s Circle/Arbeter Ring has hosted free public Yiddish concerts since 1969 featuring legendary and international cultural icons including Molly Picon, Itzhak Perlman, Mandy Patinkin and numerous other giants. VIP Seating available, for more information, please contact 212-889-6800 x 271. Claire Barry—of the legendary Barry Sisters has charmed audiences across the globe, singing in Yiddish, Russian, Hebrew and English. One of the first American Jewish artists to perform Yiddish in the former Soviet Union, Barry has also sung for Israeli troops during the Yom Kippur War (at the request of the Israeli government). The Three Yiddish Divas—Three of the most prominent names in contemporary Yiddish performance—Joanne Borts, Adrienne Cooper, and Theresa Tova, blend their multilingual repertoire and phenomenal talents. Mitch Smolkin- This 27-year-old Klezmer impresario brings his boundless energy to classic Yiddish songs. 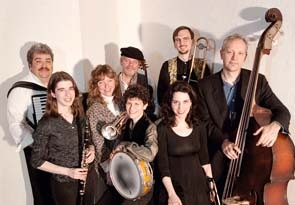 Maxwell Street Klezmer Band—founded in 1983, this Chicago band brings an old-fashioned spirit of fun to their performances of dance music, folk songs, theatre medleys and jazzy Yiddish pop music from the 1930s to the 1950s. Today’s Workmen’s Circle/Arbeter Ring, the welcoming and nurturing home for a new generation of Jews, is dedicated to the vitality of Jewish Community, Yiddish Culture and Social Justice. Thursday - 7/13: Mt Laurel Library, Mt. Laurel, NJ, 7:00 PM, for more info go to website or call 856-234-7319- free! 123rd Street between Morningside and Amsterdam Avenue. The event is hosted by The Church of the Masters and presented by JAZZMOBILE. "Socalled," aka Josh Dolgin, teams with clarinetist David Krakauer for a one-of-a-kind sound that mixes klezmer with jazz and hip hop. Dolgin has appeared on a dozen recordings as pianist, singer, arranger, rapper, writer and producer. Internationally acclaimed clarinetist David Krakauer is known for his mastery of myriad styles and is one of the world's leading exponents of Eastern European Jewish klezmer music. Funded in part by the Lazarus Family Concert Series. The Yuval Ron Ensemble unites the sacred musical traditions of Judaism, Sufism (Islamic mystical tradition) and the Armenian Church into an unusual mystical, spiritual and inspiring musical celebration. Supergroup Mikveh features the top women in Klezmer, including renowned Yiddish singer Adrienne Cooper, Klezmatics founder Alicia Svigals on fiddle, charismatic trumpeter Susan Watts of the Hoffman klezmer dynasty, ethnic accordion wizard Lauren Brody and jazz bass phenomenon Nicki Parrott. Together, they rock out with sizzling dance music and riveting Yiddish/English songs, both ancestral and brand new. Congregation Kol Ami is sponsoring Joshua Nelson, the acclaimed Black Jewish singer of Hebrew Religous Gospel Music. The concert is Sunday, July 30 at 3:00 PM (pre-concert program at 2:30 PM) at Thorne Auditorium, 750 North Lake Shore Drive, Chicago, IL. It's $45 for teens and adults and $20 for children 13 and under. Call 312-664-4475 for tickets or more information.